Prof. Christos Xenakis received his B.Sc degree in computer science in 1993 and his M.Sc degree in telecommunication and computer networks in 1996, both from the Department of Informatics and Telecommunications, University of Athens, Greece. In 2004 he received his Ph.D. from the University of Athens (Department of Informatics and Telecommunications). From 1998 – 2001 he was with a Greek telecoms system development firm, where he was involved in the design and development of advanced telecommunications subsystems. From 1996 – 2007 he was a member of the Communication Networks Laboratory of the University of Athens. Since 2007 he is a faculty member of the Department of Digital Systems of the University of Piraeus, Greece, where currently is an Associate Professor, a member of the Systems Security Laboratory and the director of the Postgraduate Degree Programme, on “Digital Systems Security”. He has participated in numerous projects realized in the context of EU Programs (ACTS, ESPRIT, IST, AAL, DGHOME, Marie Curie, Horizon2020) as well as National Programs (Greek). He is the project manager of the ReCRED project funded by Horizon2020 and the technical manager of the UINFC2 project funded by DGHOME/ISEC. He is also a steering committee member of the European Cyber Security Challenge 2017. He has authored more than 70 papers in peer-reviewed journals and international conferences. Christoforos Ntantogian, Christos Xenakis, Ioannis Stavrakakis ” Reducing False Synchronizations in 3G-WLAN Interworking Networks ,” IEEE Transactions on Wireless Communications, Vol. 10, No. 11, pp: 3765–3773, Nov. 2011. Christos Xenakis, Christoforos Panos, Ioannis Stavrakakis ” A Comparative Evaluation of Intrusion Detection Architectures for Mobile Ad Hoc Networks ,” Computers & Security, Elsevier Science, Vol. 30, Issue 1, pp: 63-80, Jan. 2011. Christoforos Ntantogian, Christos Xenakis, Ioannis Stavrakakis “A Generic Mechanism for Efficient Authentication in B3G Networks ,” Computers & Security, Elsevier Science, Vol. 29, Issue 4, pp: 460-475, June 2010. Christoforos Ntantogian, Christos Xenakis, “One-pass EAP-AKA Authentication in 3G-WLAN Integrated Networks ,” Wireless Personal Communications, Springer, Vol. 48, Issue 4, pp: 569-584, March 2009. Christos Xenakis, Christoforos Ntantogian, Ioannis Stavrakakis, “A network-assisted mobile VPN for securing users data in UMTS ,” Computer Communications, Elsevier Science, vol. 31, No. 14, pp. 3315-3327 September 2008. Christos Xenakis, “Security Measures and Weaknesses of the GPRS Security Architecture ,” International Journal of Network Security, Vol.6, No.2, pp:158-169, Mar. 2008. Christos Xenakis, Christoforos Ntantogian, “Security Architectures for B3G Mobile Networks, ” Telecommunication Systems, Springer, Vol.35, pp: 123-139, Aug. 2007. Christos Xenakis, Nikos Laoutaris, Lazaros Merakos, Ioannis Stavrakakis, “A Generic Characterization of the Overheads Imposed by IPsecand Associated Cryptographic Algorithms ,” Computer Networks, Elsevier Science, Vol. 50, No. 17, Dec 2006, pp. 3225-3241. Christos Xenakis, Lazaros Merakos, “On Demand Network-wide VPN Deployment in GPRS,” IEEE Network, Vol. 16, No. 6, pp. 28-37, November/December 2002. Ioanna Kitsaki, Anna Angelogianni, Christoforos Ntantogian, Christos Xenakis, “ A Forensic Investigation of Android Mobile Applications, ” In Proc. 22st Pan-Hellenic Conference on Informatics (PCI 2018), Athens, Greece, Nov. 2018. Christoforos Panos, Stefanos Malliaros, Christoforos Ntantogian, Angeliki Panou, Christos Xenakis, “ A Security Evaluation of FIDO’s UAF Protocol in Mobile and Embedded Devices, ” In Proc. Towards a Smart and Secure Future Internet: 28th International Tyrrhenian Workshop (TIWDC), Palermo, Italy, Sept. 2017. Angeliki Panou, Christoforos Ntantogian, Christos Xenakis, “ RiSKi: A Framework for Modeling Cyber Threats to Estimate Risk for Data Breach Insurance, ” In Proc. 21st Pan-Hellenic Conference on Informatics (PCI 2017), Larisa, Greece, Sept. 2017. Georgios Karopoulos, Christos Xenakis, Stefano Tennina, Stefanos Evangelopoulos, “ Towards trusted metering in the smart grid, ” In Proc. 22nd IEEE International Workshop on Computer Aided Modeling and Design of Communication Links and Networks (CAMAD 2017), Lund, Sweden, June 2017. Stefanos Malliaros, Christoforos Ntantogian, Christos Xenakis, “ Protecting sensitive information in the volatile memory from disclosure attacks, ” In Proc. 11th International Conference on Availability, Reliability and Security (ARES 2016), Salzburg, Austria, August 2016. Alexia Chatzikonstantinou, Christoforos Ntantogian, Georgios Karopoulos, Christos Xenakis, “ Evaluation of Cryptography Usage in Android Applications, ” In Proc. 9th EAI International Conference on Bio-inspired Information and Communications Technologies, New York City, New York, USA, Dec. 2015. Christoforos Ntantogian, Grigoris Valtas, Nikos Kapetanakis, Faidon Lalagiannis, Georgios Karopoulos, Christos Xenakis, “ Attacking GSM Networks as a Script Kiddie Using Commodity Hardware and Software, ” In Proc. 12th International Conference on Trust, Privacy & Security in Digital Business (TrustBus 2015), Valencia, Spain, Sept. 2015. Foivos F. Demertzis, Georgios Karopoulos, Christos Xenakis, Andrea Colarieti, “ Self-Organised Key Management for the Smart Grid, ” In Proc. 14th International Conference on Ad Hoc Networks and Wireless (ADHOC‐NOW 2015), Athens, Greece, June 2015. Christos Xenakis, Christoforos Ntantogian, “ Attacking the Baseband Modem of Mobile Phones to Breach the Users’ Privacy and Network Security, ” In Proc. 7th International Conference on Cyber Conflict (CyCon 2015), Tallinn, Estonia, May 2015, (slides), (video). Anastasios Stasinopoulos, Christoforos Ntantogian, Christos Xenakis, “ Bypassing XSS Auditor: Taking Advantage of Badly Written PHP Code, ” In Proc. 14th IEEE International Symposium on Signal Processing and Information Technology (ISSPIT 2014), Noida, India, Dec 2014. Anastasios Stasinopoulos, Christoforos Ntantogian, Christos Xenakis, “ The weakest link on the network: exploiting ADSL routers to perform cyber-attacks, ” In Proc. 13th IEEE International Symposium on Signal Processing and Information Technology (ISSPIT 2013), Athens, Greece, December 2013. Charalampos Petrou, Christoforos Ntantogian, Christos Xenakis, “ A better time approximation scheme for e-passports, ” In Proc. 10th International Conference on Trust, Privacy & Security in Digital Business (TrustBus 2013), Prague, Czech Republic, August 2013. Dimitris Apostolopoulos, Giannis Marinakis, Christoforos Ntantogian, Christos Xenakis, “ Discovering authentication credentials in volatile memory of Android mobile devices, ” In Proc. 12th IFIP Conference on e-Business, e-Services, e-Society (I3E 2013), Athens, Greece, April 2013. Christoforos Ntantogian, Dimitris Gkikakis, Christos Xenakis, “ PRIPAY: A Privacy Preserving Architecture for Secure Micropayments, ” In Proc. The Seventh International Conference on Systems and Networks Communications (ICSNC 2012), Lisbon, Portugal, Nov. 2012. Dimitris Tsolkas, Nikos Passas, Christos Xenakis, Vassilis Papataxiarhis, Vassileios Tsetsos, “ Busfinder: a personalized multimodal transportation guide with dynamic routing, ” In Proc. 16th Panhellenic Conference on Informatics (PCI 2012), Piraeus, Greece, Oct. 2012. Christoforos Panos, Platon Kotzias, Christos Xenakis, Ioannis Stavrakakis, “Securing the 802.11 MAC in MANETS: A Specification-based Intrusion Detection Engine,” In Proc. 9th IEEE/IFIP International Conference on Wireless On-demand Network Systems and Services (WONS 2012), Courmayeur, Italy, Jan. 2012. Foivos Demertzis, Christos Xenakis, “SOMA: Self-Organized Mesh Authentication ,” In Proc. 7th European Workshop on Public Key Services, Applications and Infrastructures (EuroPKI 2010), Athens, Greece, Sept. 2010. Nikos Vavoulas, Christos Xenakis, “A Quantitative Risk Analysis Approach for Deliberate Threats ,” In Proc. 5th International Workshop on Critical Information Infrastructures Security, (CRITIS 2010), Athens, Greece, Sept. 2010. Christoforos Panos, Christos Xenakis, Ioannis Stavrakakis, “A Novel Intrusion Detection System for MANETs ,” In Proc. International Conference on Security and Cryptography (SECRYPT 2010), Athens, Greece, July 2010. Christos Xenakis, Danae Apostolopoulou, Angeliki Panou, Ioannis Stavrakakis “A Qualitative Risk Analysis for the GPRS Technology ,” In Proc. IEEE/IFIP International Conference on Embedded and Ubiquitous Computing (EUC-08), Shanghai, China, December 2008. Christoforos Ntantogian, Christos Xenakis, Ioannis Stavrakakis, “Reducing the User Authentication Cost in Next Generation Networks, ” In Proc. 5th IEEE/IFIP Annual Conference on Wireless On demand Network Systems and Services (WONS 2008), Garmisch-Partenkirchen, Germany, Jan 2008. Christoforos Ntantogian, Christos Xenakis, Ioannis Stavrakakis, “Efficient Authentication for Users Autonomy in Next Generation All-IP Networks, ” In Proc. 2nd International Conference on Bio-Inspired Models of Network, Information, and Computing Systems (BIONETICS 2007), Budapest, Hungary, Dec 2007. Christoforos Ntantogian, Christos Xenakis, “Reducing Authentication Traffic in 3G-WLAN Integrated Networks,” In Proc. 18th Annual IEEE International Symposium on Personal, Indoor and Mobile Radio Communications, (PIMRC 2007), Athens, Greece, Sept 2007. Christoforos Ntantogian, Christos Xenakis, “A Security Protocol for Mutual Authentication and Mobile VPN Deployment in B3G Networks,” In Proc. 18th Annual IEEE International Symposium on Personal, Indoor and Mobile Radio Communications, (PIMRC 2007), Athens, Greece, Sept 2007. Christoforos Ntantogian, Christos Xenakis, “A Security Binding for Efficient Authentication in 3G-WLAN Heterogeneous Networks,” PhD poster presented in the 6th Annual Mediterranean Ad Hoc Networking Workshop (Med-Hoc-Net 2007), Corfu, Greece, June 2007. Christos Xenakis, Lazaros Merakos, “Vulnerabilities and Possible Attacks against the GPRS Backbone Network,” In Proc. International Workshop on Critical Information Infrastructures Security, (CRITIS 06), LNCS 4347, Springer, 2006, pp. 262 – 272. Dimitris Karteris, Christos Xenakis, Lazaros Merakos, “Context-Aware Service Provisioning in All-IP Networks,” In Proc. 13th IST Mobile & Wireless Communications, Lyon, France, June 2004. Christos Xenakis, Lazaros Merakos, “ Enhancing End-users Privacy in 3G Networks, ” In Proc. 10th WWRF Meeting, New York, NY, USA, October 2003. Christos Xenakis, Lazaros Merakos, “Dynamic Network-based Secure VPN Deployment in GPRS,” In Proc. IEEE PIMRC 2002, Lisboa, Portugal, pp. 1260-1266, Septeber 2002. Christos Xenakis, Lazaros Merakos, “Security Architecture Standardization and Services in UMTS,” In Proc. Mobile Venue 2002, Athens, Greece, pp. 585-592, May 2002. Christos Xenakis, Evangelos Gazis, Lazaros Merakos, “Secure VPN Deployment in GPRS Mobile Network,” In Proc. European Wireless 2002, Florence, Italy, pp. 293-300, February 2002. Nikos Loukas, Christos Xenakis, Lazaros Merakos, Iakovos Venieris “Access Signaling and IN-based Mobility Management for Wireless ATM Systems,” In Proc. IEEE ICUPC 1998, Florence, Italy, October 1998. Nikos Loukas, Christos Xenakis, Lazaros Merakos, Iakovos Venieris “Signaling and Mobility Control for Wireless Intelligent ATM CPNs,” In Proc. IEEE PIMRC 1998, Boston, USA, September 1998. Nikos Loukas, Christos Xenakis, Lazaros Merakos “Transport Performance Evaluation of an ATM-based UMTS Access Network,” In Proc. IEEE ICUPC 1997, San Diego, USA, October 1997. Georgios Karopoulos, Christoforos Ntantogian, Christos Xenakis, “Privacy-Preserving Aggregation in the Smart Grid,” Chapter in Security Solutions and Applied Cryptography in Smart Grid Communications (Mohamed Amine Ferrag, Ahmed Ahmim), IGI Global, August 2016. Christoforos Ntantogian, Christos Xenakis, “Privacy Mechanisms in 4th Generation Networks,” book chapter in “Protection Privacy in Information and Communication Technologies: Technical and Legal Issues,” Papasotiriou (2009), editor: K. Labrinoudakis, L. Mitrou, S. Gkritzalis, S. Katsikas. Christoforos Ntantogian, Christos Xenakis, “Security Architectures for B3G Mobile Networks,” book chapter in “Handbook of Research on Wireless Security,” Information Science Reference (2008), editor: Yan Zhang, Jun Zheng, Miao Ma, ISBN: 978-1-59904-899-4. Christos Xenakis, “Security in UMTS 3G Mobile Networks,” book chapter in “Handbook of Research on Wireless Security,” Information Science Reference (2008), editor: Yan Zhang, Jun Zheng, Miao Ma, ISBN: 978-1-59904-899-4. Christos Xenakis, “Security in 2.5G Mobile Systems,” book chapter in “Handbook of Research on Wireless Security,” Information Science Reference (2008), editor: Yan Zhang, Jun Zheng, Miao Ma, ISBN: 978-1-59904-899-4. Christos Xenakis, Lazaros Merakos, “Security in Mobile Telecom Networks,” book chapter in “Network Security: Current status and future directions,” Wiley-IEEE Press, editor: Christos Douligeris and Dimitrios Serpanos, June 2007, ISBN: 978-0-471-70355-6. Christos Xenakis et al., “Security & Trust” book chapter in “Technologies for the Wireless Future: Wireless World Research Forum (WWRF), volume 2, Wiley, editor: Rahim Tafazolli, 2006, ISBN: 0-470-02905-6. Christos Xenakis, ” Device-centric authentication for Online Services, ” 2nd Infomobility World Conference, Athens, Greece, Dec 2017. Christos Xenakis, ” Addressing Cybersecurity challenges and REA’s role therein: The ReCRED project, ” REA.B.4 Science Conference, Brussels, Belgium, Nov 2017. Christos Xenakis, ” Password-less Authentication and Anonymous Access for on-line Services & eCommerce, ” eCommerce Expo 2017, Athens, Greece, Nov 2017. Christos Xenakis, ” Password-less Authentication and Anonymous Access for Future Internet, ” Workshop on Information and Communication Security, Hellenic National Defense General Staff, Athens, Greece, Nov 2017. Christos Xenakis, ” Keynote Speech: Device-centric authentication for future Internet, ” 2017 Tyrrhenian Workshop on Digital Communications: Towards A Smart And Secure Future Internet, Mondello (Palermo), Italy, Sept. 2017. Christos Xenakis, ” Beyond password authentication: a device centric approach, ” Guest Lecture, Technical, University of Darmstadt, Darmstadt, Germany, June 2017. Christos Xenakis, ” From Password–less Authentication to Anonymous Access, ” 3rd ICT Security World Congress 2017, Athens, Greece, June 2017. Christos Xenakis, ” European Cyber Security Challenge 2017: The Hellenic Cyber Security Team, ” InfoCom Security 2017, Athens, March 2017. Christos Xenakis, ” Addressing the problems with passwords: the ReCRED’s approach for device-centric access control, ” 8th Scientific Workshop for Students: “Security for everything, everyone, anytime” of the IEEE University of Thessaly (Lamia) Student Branch, Lamia, Greece, March 2017. Christos Xenakis, ” European Cyber Security Challenge 2017: The Hellenic Cyber Security Team, ” 2nd Forward Thinking Cybersecurity, (ISC)² Hellenic Chapter, Athens, Greece, March 2017. 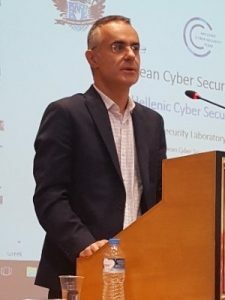 Christos Xenakis, ” Cyber Security in Greece, ” Workshop on Cyber Security in Greece organized by Center for Security Studies & European Cyber Security Organization (ECSO), Athens, Greece, March 2017. Christos Xenakis, ” A New Type of Malware that Targets the Modem of Mobile Devices, ” 1st Annual Conference for Protecting Critical Infrastructure, organized by Center for Security, Athens, Greece, Dec. 2016. Christos Xenakis, ” Addressing the problems with passwords: the ReCRED’s approach for device-centric access control, ” European Cyber Security Month (ECSM 2016), Piraeus, Greece, Oct. 2016. Christos Xenakis, “ Addressing the problems with passwords: the ReCRED’s approach for device-centric access control, ” Cybersecurity: The Expanding Frontier, Presentation at the International Hellenic University, Thessaloniki, Greece, July 7, 2016. Christos Xenakis, “ From Real-world Identities to Privacy-preserving and Attribute-based CREDentials for Device-centric Access Control, ” InfoCom Security 2016, Athens, April 2016. Christos Xenakis, “ From Real-world Identities to Privacy-preserving and Attribute-based CREDentials for Device-centric Access Control, ” Open Identity Exchange Workshop, Amsterdam, Netherlands, March 24, 2016. Christos Xenakis, “ R&D in the field of Security and Privacy: Made in Greece, ” Innovating for Privacy, Piraeus, Greece, April 2015. Christos Xenakis, “ Experience from recent National & International Cyber Exercises, ” (ISC)2 Hellenic Chapter: The New Era of Cyber Security, Piraeus, Greece, December 2014. Christos Xenakis, “ Storing Personal Data on Mobile Devices, ” 2nd Seminar of the Greek Centre for Cybercrime (GCC), Athens, Greece, November 2014. Christos Xenakis, “ An Advanced Persistent Threat in 3G Networks: Attacking the Home Network from Roaming Networks, ” InfoCom Security – InfoCom 2014, Athens, April 2014. Christos Xenakis, Christoforos Ntantogian, “ Acquisition and Analysis of Android Memory, ” Cybercrime Network Conference – CyNC 2013, Center for Cybersecurity & Cybercrime Investigation, University College Dublin, Dublin, Ireland, December 2013. Christos Xenakis, “ Compromising users’ privacy from stolen/lost mobile devices: the Android case, ” In Proc. 7th International Crisis Management Workshop (CrIM’13) and Oulu Winter School, University of Oulu, Finland, Nov. 2013. Christos Xenakis, “An improved authentication scheme for B3G heterogeneous mobile networks,” 4th annual workshop on PRacticalAspeCts of Security (PRACSE), Athens, June 2009. Christos Xenakis, “Security Considerations in 2.5G Mobile Networks”, 9th Conference of Greek Information and Communications Technology (ICT) Forum, Organized by Ministry of Economy and Finance, Athens, October 2007. Christos Xenakis “3rd Generation Mobile Telecom Network (3G/UMTS) and Security”, 3rd International Conference Electronic Crime 2005, Co-organized by OTE and MD5 S.A., Athens, October 2005. Christos Xenakis “Security issues in third generation mobile systems”, 7th International Telecommunication Conference (INFO-COM), Athens, September 2005. Christos Xenakis “Security in Next Generation Mobile Data Networks”, Workshop on Trust & Security in eBusiness Processes, jointly organised by the AMSD, RAPID and PAMPAS roadmap projects, Brussels, December 2002. Christos Xenakis “Security in 3G Networks”, Conference on Security in Cyberspace and Hacking, jointly organized by Hellenic Army and University of Athens, Athens, October 2001. – member of the editorial board of the Computer Communications Journal of the Elsevier publishing.